We are a family business that provides a friendly, competitively priced and professional service. We are certified members of the British Pest Control Association and thereby observe their codes of practice and conduct assuring that our work is carried out to the highest standards. Our training includes R.S.P.H, N.V.Q, Food Hygiene, Supervising Food Safety and is constantly being updated enabling us to deal with any situation from an odd domestic mouse up to service contracts to comply with B.R.C and S.A.L.S.A audits. Biological Audits and Technical Reports can also be provided should you require this service. We cover all areas within Lancashire, West and North Yorkshire. ADI Pest Control has worked with us here at Sovereign Health Care in Bradford for 9 happy years. They are the epitome of dedication and professional…with a friendly face, we continue to rely on their sound advice and outstanding service. We look forward to maintaining our relation with ADI well into the future. Not everyone likes the thought of little furry creatures making your home or working environment, THEIR HOME. I'm even agitated to the point of 'break my neck to get away from it' if a wasp comes within buzzing distance of me. But, I don't have to worry about any of that, I have Les. A.D.I. Les. He's my hero. I know that if a striped kamikaze wasp built its' nest within buzzing distance of me, I could call Les, and the nest will be no more. I know that if there were a problem with Mice or Rats, I could call Les, and the problem will be no more. Actually, I contracted Les many years ago, and since we handed the Pest Control over to him, he has kept a commendable watch on our premises for all furry visitors, stripy stingers and anything else 'untoward'. 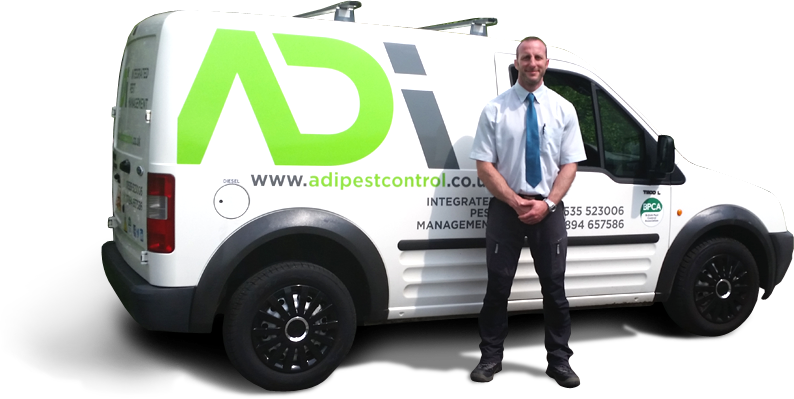 ADI Pest Control have looked after both our old and new buildings and the best compliment I can pay them is that we never see any pests. The staff are very professional and knowledgeable and I would recommend them to anyone requiring their services. We got ADI in in April 2013 on recommendation from one of our customers. We had over the last 30 years used various other companies who had at best been adequate – good paper work, but lots of personnel changes. By contrast les and his small team are very " hands on" , very thorough and very experienced. From blocking up the smallest hole, to positioning insectocutors,to advising us how best to achieve our SALSA accreditation, to pointing at detailed cleaning on complex machinery and much more. In brief we are very happy that ADI deal with our pest control and recommend them to you. The Cathedral has used ADI Pest Control for over twenty years. The company is very professional with high standards and extensive knowledge with an efficient and well organised approach to the problems we encounter here: not unique problems, but as an ancient and Grade 1 listed building we need a sympathetic yet realistic answer to the issues we encounter. This is just the approach ADI provide, with the minimum of fuss and disruption to both the fabric of the building and the everyday working needs of the Cathedral and its staff. I would recommend ADI to anyone for quality of service and professional attitude … and they are really nice and friendly people! Parcevall Hall is situated in the Yorkshire Dales and has a very scenic but rural setting. For many years now we have used ADI Pest Control as a deterrent against pests which could cause problems if any species decided Parcevall was a cosy environment to set up there home from the out doors. We cannot speak more highly of the professional and efficient way in which ADI service these premises.